The Blues Brothers are an American blues and soul revivalist band founded in 1978 by comedians Dan Aykroyd and John Belushi as part of a musical sketch on Saturday Night Live. Belushi and Aykroyd, respectively in character as lead vocalist "Joliet" Jake Blues and harmonica player/vocalist Elwood Blues, fronted the band, which was composed of well-known and respected musicians. The band made its debut as the musical guest on the April 22, 1978, episode of Saturday Night Live. 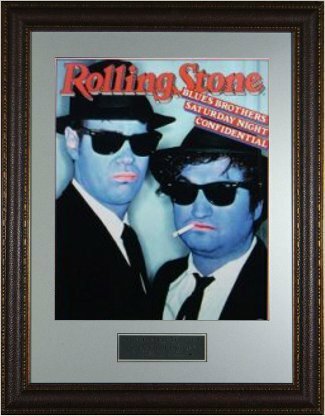 Enjoy this Blues Brothers custom premium Leather framed unautographed 11X14 photo from Rolling Stone.